My work usually involves people in all walks of life. I am interested in their gestures. The way a body is sprung and expresses emotion. The way a body holds the impulse of the next movement already in it. Contained gesture. Their spirit, the movement in their bodies, their relationship to one another and to their surroundings – the mood held in their gestures. What they seem to be saying to each other, who they are, what perhaps they are thinking. Lately I have been watching people’s relationship with their animals. Watching the dance between them, the checking in, the projection. it is largely a non verbal relationship. The wordlessness is the best thing. Just a marvelling, a tenderness, a connection. These things catch my attention and make me want to paint them and the rest comes with the paint. Belinda Wilson graduated from the Elam School of Fine Art in Auckland New Zealand in 1975 with a Diploma of Fine Art with Honours. She spent a considerable period of her early working career overseas in the UK, USA and Australia. Painting in studios in those countries, taking on various commissions, studying, and working with other artists. In 1992 she settled in Auckland with her two children continuing her studio work and exhibiting regularly in Auckland and other galleries round the country. 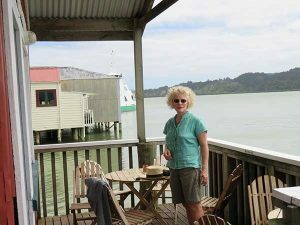 As well as her studio practice Belinda has continued to teach small groups painting and drawing for the last 24 years. The website is an opportunity for me to archive past work for interest sake and to show current themes I am working on. Some of this work is available, some in galleries and some of it in my collection.